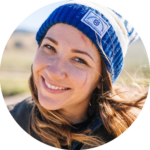 Passionate about riding, Adrienne is an instructor for Two Wheel Safety Training, creator of Pistons & Poppies jewelry, and part of Hot Rides SF moto collective. Located in Oakland, California, her daily rider is a Triumph. Guest Author Adrienne and photographer Genevieve Davis give us an inside look at the third annual desert off road meet up from Babes Ride Out- Babes in the Dirt!